Tacos are delicious, but the best of all, they're cheap. For $3 (and often less), you can get fish, chicken, or steak in a magic disc, straight to your mouth. It's one of the best aspects of Mexican cuisine and an obviously egregious problem when Mexican spots like Chipotle somehow screw it up. 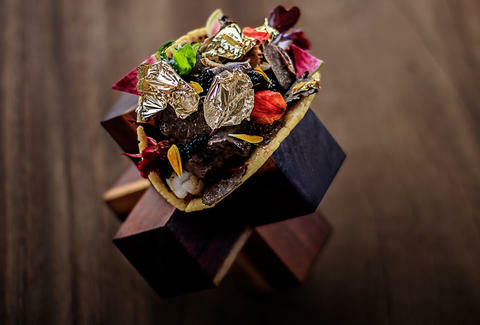 But here's a new, insane sin: Chef Juan Licerio Alcala has created a $25,000 taco that apparently no one actually wants to order. He runs the kitchen at the Grand Velas Los Cabos resort hotel in Baja California, Mexico, where you pay thousands and thousands of dollars a night to stay in rooms that are probably too nice for most average humans to enjoy, kinda like this taco. "People are excited and a little surprised about how you can eat a taco for $25,000 (497,000 pesos) when you can find one on the street for 10 pesos," Licerio told AFP. For starters, you have to put a deposit on it before you eat the damn thing -- that's $12,500 -- and you have to have already booked a room at the hotel's presidential suite, which will certainly cost thousands of dollars a night (rates may fluctuate depending on the reservation). The taco will then be served to you "in the middle of the desert encircled by motorcycles" and can be adjusted if this happens during a marriage proposal. The dish itself is made with a corn tortilla speckled with 24-karat gold flakes, filled with Kobe beef, langoustine shrimp, the world's most expensive Almas Beluga caviar, and black truffle Brie cheese. Licerio tops it with a salsa of Morita chilies and civet coffee, aka coffee made from the fermented poop of this animal after it eats berries from a coffee plant. He finishes it all off with gold flakes, of course. No one has ordered this ridiculous thing yet, of course, because tacos are meant to be inhaled and because, honestly, the tacos you'll find in these places will probably all taste better and will be way easier to find anyway. Cheers.